← A Cupcake Revelation…this is how you eat it. Thirty-four year-old Elizabeth does not have it easy. Her younger sister is a reckless, alcoholic who is constantly losing jobs, disappearing, and leaving Elizabeth to do all the clean-up work. Part of this, includes raising Saoirse’s 6-year-old son, Luke. Add to the mix a reclusive and distant father, and a mother who abandoned the family when Elizabeth was 13, and its no wonder that Elizabeth is constantly hiding away from people. One day, Ivan, an invisible friend from the land of Ekam Eveileb strolls into Luke’s life, but it’s not Luke Ivan was sent to befriend, it was Elizabeth. Can Ivan help Elizabeth learn to cope with the struggles in her life? This is a very heart-warming and endearing book by Cecilia Ahern. She is definitely one of those consistent authors whose books I can always rely on for a good laugh or tear and for general amusement. I liked this book because it was more psychological than the others. It focuses a lot on dysfunctional families, alcoholism, and on coping mechanisms for the lemons life throws at you. With the help of Ivan, Elizabeth rediscovers her childhood, something that was lost to her when her mother ran off and left Elizabeth to raise her 6-month-old sister Saoirse. I really liked the character of Ivan. He was funny, innocent, and could get straight to the point in the way that kids too. Ivan, is basically a kid, even though he’s 6 feet tall. He befriends kids who are going to troubles and helps them learn to appreciate and value themselves. Although parts of the book were predictable, I don’t think they took away from the overall message and feel of the book. I really felt for Elizabeth, and as much as I wanted to dislike her sister and father, I could sympathize with them, as they are also the broken-hearted victims of Elizabeth’s mother’s abandonment. I wouldn’t say that this one of Ahern’s best work, but it is entertaining and thoughtful. A few of the storylines could have been expanded (ie, Benjamin), and some of the characters should have had more depth (Poppy), but overall, it was well-balanced and well-paced. This book is a good reminder to all adults to not take life so seriously, and to just stop and let our hair down every once-in-awhile. 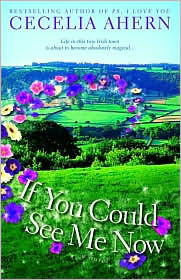 This entry was posted in Books and tagged Book review, Books, Cecila Ahern, if you could see me now. Bookmark the permalink.